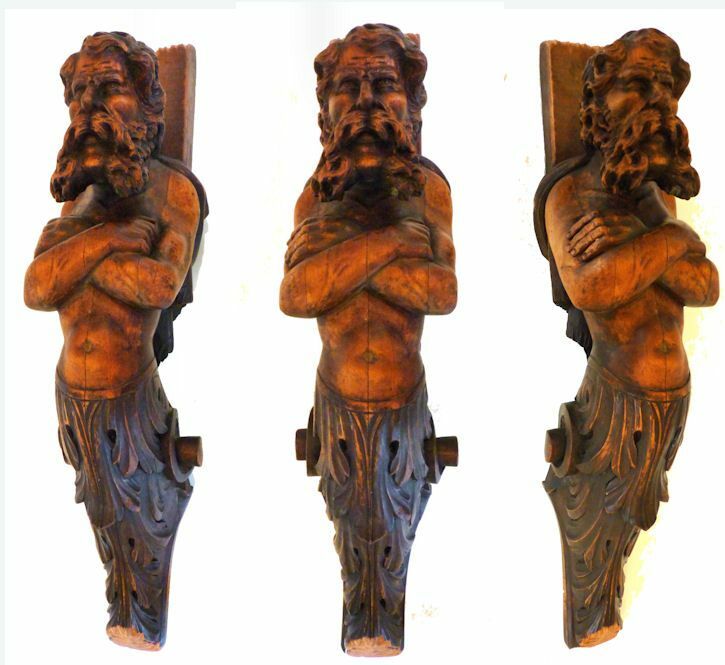 To view our current inventory of authentic carved wood antique figureheads, click here! THIS FINE OLD CARVING HAS BEEN SOLD. Thank You! Presented is a carefully incised carving of a heavily beaded male whose torso blends into a carved acanthus foliate and a scroll forming a traditional billethead. Infrequently a figurehead carver would make a scale model of his intention, and we believe this may be one of them. It also may have been made for a small ship. More often a carver might do a drawing of the design, and these are found in some museums. The top picture shows how it would look if mounted on the bow of a ship. This figurehead has features bordering on a scroll, and has crossed his arms which is believed to indicate a tough stance and that he is in a position of authority. If this was an architectural carving as many are, the wood backboard plank would have been omitted. CONSTRUCTION: The figure is hand carved from four 1 3/4 inch by 5 3/4 inch maximum width planks laid side-by-side. The wood is believed to be Mahogany. There is a vertical backboard plank with a drilled hole at the top that is 1 1/4 inch thick by 3 1/2 inch wide. On one side it shows the marks of being held in a wood vise. This plank appears to extend out of the figure's cape which does not seem possible, but there is no visible seam around it. There are no fittings or glue showing anywhere. The entire piece was coated in varnish which has turned dark with age. The varnish on most of the figure's skin was removed a long time ago. We have not seen many of these small size figureheads and fewer still of models even in museums. The few we know of went for very high prices from some of the better nautical galleries in this country. If you don't want a full figurehead because of space or financial considerations, this may fit the bill. PROVENANCE: The helmet comes from a very large and eclectic collection of nautical antiques that included fine examples of rare antique navigation instruments, a collection of French Prisoner of War models, numerous scrimshaw, log books, charts, and marine relics. They were acquired over many years by a professor of oceanography, with a love of all things nautical, and were last located in Hawaii. This was his residence at the time he of his death. This piece is estimated to have been in the collection for at least the last 30 years. CONDITION: This figurehead is approximately 150 years old. The varnish has darked with age and on the figure's skin was removed years ago and there is some wear elsewhere. There is a split in the wood at the right bottom, and on the back of the flat plank there is a recess that shows light in the above picture. There are some small handling abrasions all of which show age, and some scattered small dots of white paint. Overall there is nothing that requires comment, and it should be considered in excellent condition. We estimate the carving to be about 150 years old. Its small 26 inch size makes it ideal for display in a home or office. Figureheads as an art form are long past, having gone the way of the sailing ships upon which they graced the bow. American figurehead carvers were renown for their work, which flourished from colonial times until the late nineteenth century. 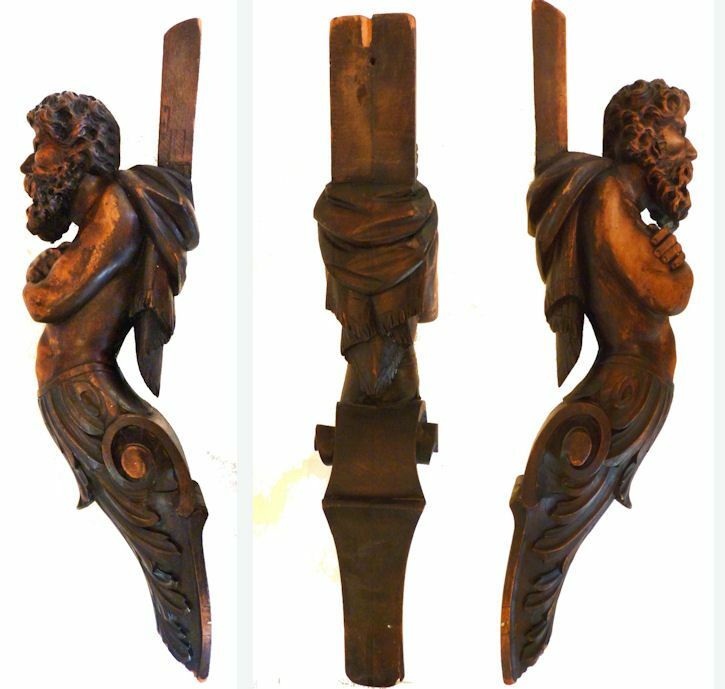 Most every class of ship, from steamboats to whalers to clipper ships, came to be ornamented with carving which would include trailboards, stern boards and various types of figureheads. As was fitting, large ships generally had full length figures of generous proportions while smaller ships had busts, heads, and half and three-quarter-length figures with scroll and leaf carving fitted or as is the case of this example. During the 18th and 19th cent. a highly developed and original art of figurehead wood carving flourished in the United States at a time when little other sculpture was practiced. Few authentic examples survive outside of museums. Figurehead art became practically extinct with the disappearance of the sailing vessel, and today may only be found in maritime museums. This is a great opportunity to acquire an apartment size one for your personal enjoyment. SHIPPING & PACKING: The cost of shipping, packing, handling, and insurance to your destination, must be calculated and is an additional charge. You may email us beforehand to get these costs. We price our shipping honestly, but we expect to be reimbursed for the nominal cost of packaging materials and handling. International buyers welcome, but should inquire first. We have satisfied customers in Argentina, Australia, Austria, Belgium, Bermuda, British Virgin Islands, Canada, Chile, China, Czech Republic, Democratic Republic of Congo, Denmark, Estonia, England, France, Germany, Greece, Holland, Hong Kong, Hungary, Iceland, Ireland, Israel, Italy, Japan, Kuwait, Latvia, Luxembourg, Malaysia, Martinique, Mexico, New Zealand, Norway, Nova Scotia, Panama, Poland, Portugal, Puerto Rico, Romania, Russia, Saudi Arabia, Scotland, Singapore, Spain, Sweden, Switzerland, Thailand, Turkey, United Arab Emirates, USVI and the Eastern Caribbean. STANDARD FORMS OF PAYMENT are Bank wire transfer, cashier's check, money order, or personal check in which case the item will be held until cleared. Our are prices our quoted net to us so that the use of credit cards or PayPal incur extra charges. Terms on overseas sales may be different.